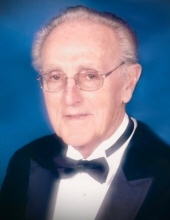 Louis A. Huewe,87, of Remsen, IA, died Monday, Feb. 27, 2019 at Happy Siesta Health Care Center in Remsen, IA. Mass of Christian Burial will be 10:30 a.m. Thursday, March 7, 2019 at St. Catherine’s Catholic Church in Oyens, IA with Father William McCarthy officiating. Visitation will be 9-10 a.m. on Thursday at Fisch Funeral Home & Monument in Remsen. Louis was born September 21, 1931 to Otmar H. and Leonora (Wagner) Huewe. He was raised and educated in Remsen and graduated from Remsen St. Mary’s High School in 1949. Louis worked for the City of Remsen for over 50 years. He volunteered many hours fixing the bells and lights at St. Mary’s Church. He was a member of Remsen St. Mary’s Catholic Church and Remsen Fire Department for 45 years. He was a member of the Sportsman’s and was also a Representative of Remsen at the Iowa Association of Municipal Utilities. He enjoyed farming with his longtime friend Dan Ruhland, cooking, traveling, going gambling on the Happy Siesta bus, butchering with Rich Ruba, fishing, and having a few beers with friends. Survivors include two sisters Colette Kramer of Omaha, NE, and Grace O’Hare of Sioux City, IA., 6 nieces and 3 nephews. He was preceded in death by his parents and one sister Maxine Newman. Casket bearers will be Russell Ruhland, Kyle Gengler, Richard Ruba, William Lindley, Bart Galles & Lee Galles. To send flowers or a remembrance gift to the family of Louis Anthony Huewe, please visit our Tribute Store. Visitation will be 9-10 a.m. on Thursday at Fisch Funeral Home & Monument in Remsen. "Email Address" would like to share the life celebration of Louis Anthony Huewe. Click on the "link" to go to share a favorite memory or leave a condolence message for the family.